The main library at the University is Denisenko Science and Technical Library of NTUU KPI. The Library is named after Grigoriy Denisenko, the former rector of Kyiv Polytechnic Institute who has organized the construction of the current library building that occupies a huge area of 14 thousand square meters. Beyond the stylish and comfortable design, Library offers an impressive collection developed for over a century since 1898. University Colleges and Institutes have their own libraries. Here are the links to the best science-specific search engines on the Internet. 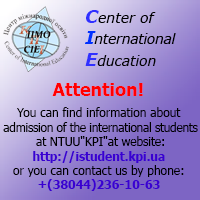 Share this information with your friends and colleagues.